Can Kongdoo carry this success into week three of the LCK? Kongdoo Monster dealt KSV Esports their first loss of the season with a stunning 2-0 victory over the Korean giants earlier today. In a David vs. Goliath matchup, this series saw the reigning world champions in KSV take on Kongdoo, who just recently made its return to the LCK. While Kongdoo had shown flashes of strong play over the last two weeks, nobody expected them to have any chance at beating KSV—not even KSV themselves. In what seemingly was their hubris at play, KSV started the match with a very disrespectful draft, which gave Kongdoo a strong composition with Jarvan IV, Galio, and Alistar. In contrast, KSV built a hard-scaling team that would be vulnerable until the late game. And somewhat surprisingly, Kongdoo abused KSV’s cocky drafting. Great coordination between Kongdoo’s Alistar, Jarvan IV, and Galio kept KSV in the air during teamfights with their knockup abilities. 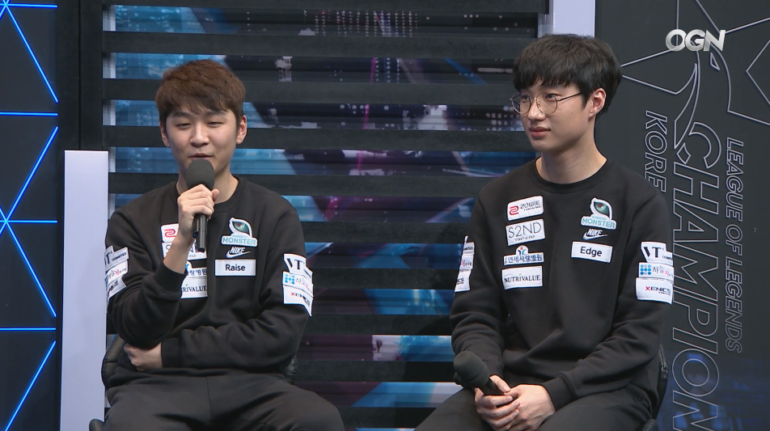 The series seemed to return to normal in game two, as KSV drafted a normal team composition and dominated the early game. But after a beautifully played teamfight by Kongdoo mid laner Lee “Edge” Ho-seong and AD carry Seo “SSol” Jin-sol, Kongdoo gained control of the Baron, the match, and the series. Both KSV and Kongdoo are set to return to the LCK stage on Jan. 30, when they face MVP and Jin Air Green Wings, respectively.